NASA on Monday (Sept. 19) unveiled a billion-dollar plan to purchase flights of new private space taxis to fly American astronauts to and from Earth orbit now that the agency's shuttle fleet is retired. The U.S. space agency will purchase commercial spaceflights for astronauts as part of its Integrated Design Contract, which will award $1.61 billion to companies that successfully develop a complete spaceflight package — one that includes rockets, spaceships, launch services, ground and mission control operations, and spacecraft recovery after landing. A draft request for proposals for the Integrated Design Contract (IDC) was released Monday and NASA expects to award it to several commercial space companies for the period between July 2012 and April 2014. "This IDC effort will bring us through the critical design phase to fully incorporate our human spaceflight safety requirements and NASA's International Space Station mission needs," said NASA Commercial Crew Program Manager Ed Mango. "We look forward to strong U.S. industry response." NASA's space shuttle program was retired in July after 30 years of spaceflight. With the shuttle fleet headed to museums, the agency currently depends on Russia's Soyuz spacecraft to ferry astronauts to and from the International Space Station. Russia, Europe and Japan also provide unmanned cargo ships to haul supplies to the orbiting lab. But NASA needs its own way to launch Americans into space. The agency's new spaceship, the Orion Multi-Purpose Crew Vehicle, is slated for deep space missions to an asteroid or elsewhere. It is not expected to fly on its first crewed mission atop NASA's new giant rocket, called the Space Launch System, until about 2017. To fill that spaceflight gap, NASA has turned private space industry. The space agency currently has two contracts with different private spaceflight companies to launch unmanned American cargo ships to the space station. — A $1.6 billion deal with the California-based company Space Exploration Technologies (SpaceX) to fly 12 delivery flights using its robotic Dragon space capsule and Falcon 9 rocket. SpaceX has already flown the Dragon capsule on one test flight, and plans to launch the vehicle on its maiden trip to the International Space Station by the end of this year. — A $1.9 billion deal with the Virginia-based company Orbital Sciences Corp., to provide eight cargo missions using its unmanned Cygnus spacecraft and Taurus 2 rockets. Orbital plans to launch its first test flight of the Taurus 2 booster by the end of this year with the goal of flying the first Cygnus mission to the space station in February 2012. 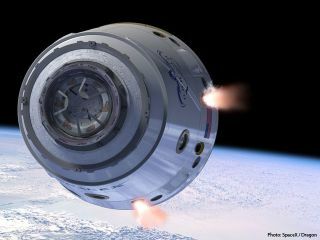 Under that agreement, SpaceX received $75 million to develop its crewed version of the Dragon space capsule and a launch abort system for emergency escapes. Like SpaceX, Boeing is developing a space capsule, which the company calls the Commercial Space Transportation-100, or CST-100. The company received $92.3 million for the project under the CCDev2 funding award from NASA. Sierra Nevada is developing a reusable space plane called Dream Chaser that is smaller than NASA's space shuttle and can launch atop an expendable rocket. The company won $80 million in funding in the CCDev 2 awards. Blue Origin, which was founded by Amazon.com CEO Jeff Bezos, is also building a space capsule system, but the company has released few details other than the fact that it is designed to carry seven astronauts, stay at the space station for 210 days and make a land landing. Bezos' company received $22 million to fund spacecraft and launch escape system development. All of the CCDev 2 awards are milestone-based, meaning that the four companies receive funds for hitting specific goals set by NASA. An artist's interpretation of the Dream Chaser vehicle after spacecraft separation. On Monday, NASA announced that it did add some optional milestones to the deals with Sierra Nevada and Boeing that, if met, could net the two companies more funding. NASA added four extra milestones for Sierra Nevada, worth a total of $25.6 million, which would push the company's net CCDev 2 award to $105.6 million if completed. Boeing received three new optional milestones worth a total of $20.6 million, pushing its total possible CCDev2 award up to $112.9 million, NASA officials said. "All four CCDev2 partners are performing very well and meeting their milestones," said Phil McAlister, director of NASA's Commercial Spaceflight Development. "These additional milestones were selected because they sufficiently accelerated the development of commercial crew transportation systems to justify additional NASA investment."